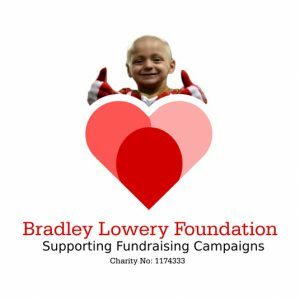 The Bradley Lowery Foundation was established in August 2017 after Bradley Lowery lost his fight to Neuroblastoma, a rare and aggressive form of childhood cancer. In 2013 his mum, Gemma, started a fundraising campaign to raise funds to get Bradley treatment in the USA, which was not available in the UK. The campaign was very successful and with the support off thousands of people, raised over £1.3m, as well as vital awareness for neuroblastoma and childhood cancer in general. The donations provided the funding base for the charity. The Bradley Lowery Foundation aims to support families who are fundraising for treatment or equipment, which is not readily available or covered by the NHS. This includes all illnesses and conditions. The foundation also: supports research into neuroblastoma and childhood cancers; is developing plans to support a £600,000 holiday home in Scarborough; runs a support line for the families of children with cancer in the North East. Having the foundation, has given me a purpose. I know that Brad would be so proud to see how many children his name is able to help. He has left a lasting legacy, and I know that although he was only with us for a short time, with his strength and determination, he has changed the lives of many. I am so proud of my little boy, he inspires me every day to keep fighting for families we support.